I have not written about the magnificent 7 for a couple of months and it is rather appropriate to review them following the strong performance displayed by equity markets around the world since then. In September I wrote: “I have not changed my view of no double dip and the FED QE2 (USD 1 trillion dollar additional liquidity) if confirmed will fuel asset prices. […]The S&P500 … has yet to pass the 1200 mark again which I expect to be done by the end of the year”. Since September, the S&P 500 went up 20% (including last week correction). Late October the market started to accelerate and became overextended; events in the Arab world have triggered an overdue correction. Economic news from the US continue to point towards a continued GDP growth and a (slowly) improving situation in unemployment; Commercial and Industrial Loans at All Commercial Banks in the US have definitely passed the trough and now seems to be well entrenched in an upward move: it shows that banks are again net lenders to the economy (+ USD 13.7 billion in two months – for other economic indicators please refer to http://marketsandbeyond.blogspot.com/2011/02/us-economy-outlook.html). In Europe Germany is almost exclusively the only growth engine with a rapidly improving economy on the back of strong exports and an improving domestic consumption. Fast growing economies in the rest of the world continue to forge ahead whilst inflation is becoming a real issue and will put pressure on Central Banks/Governments to act sooner rather than later; this is reflecting in stock markets (+/- 10% down). S&P 500 Banks index: the index has traded range bound for 18 months and has yet to decisively to breach the 165 level; there is no sign this happening any time soon and, conversely, there is no sign of a deterioration either. In my opinion, the level comes from a continuing reappraisal of the future profitability of banks (less leverage more controls) versus their ability to pass on additional costs to customers. Positive. 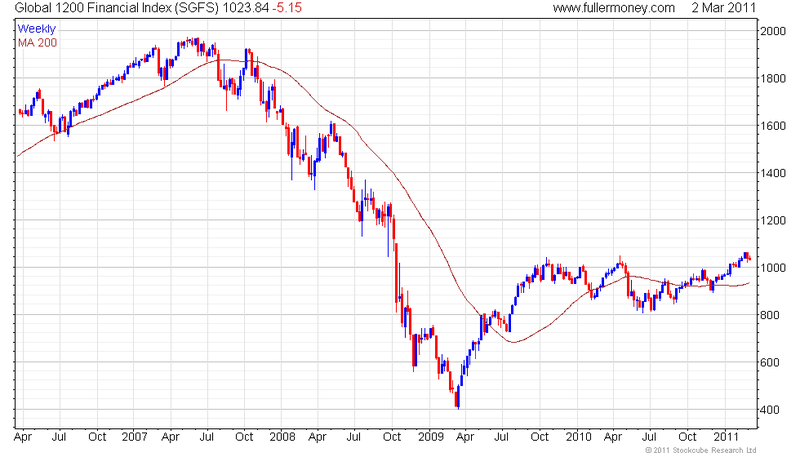 Global 1200 financial index: Since July 2009, the world financial is trapped within a 20% range, 800 representing a solid floor and 1000 a ceiling difficult to decisively pass. Reasons for this are equivalent to the US: new domestic/regional rules and new BIS capital ratios. However, in Asia, banks are slightly under pressure due to persisting questions about the magnitude of non-performing loans in China in a booming economic environment which is spurring inflation, whilst in Europe fears about the health of Eurozone banks regularly comes back to the forefront together with problems with PIGS countries. 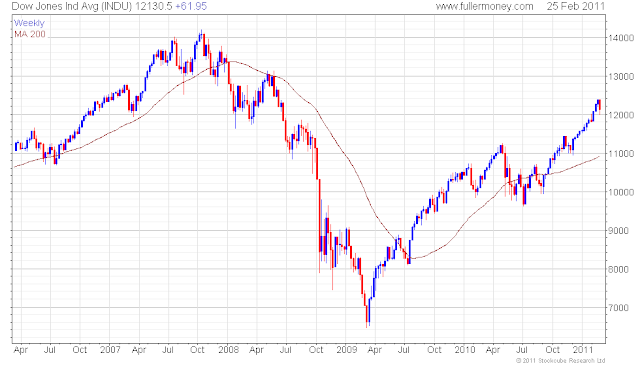 The index continues trading around its 200 days moving average. Positive. TED spread (LIBOR USD 3 mth - US 3 mth T-bills): the spread continues to stand well below its 20 years average (the OIS displays the same pattern whilst has started to pick up since December reflecting persistent question marks about the quality of European banks’ assets) . The interbank market shows no stress. Positive. USD bank BBB 10 yr - US 10 yr yield: After posing for a coupe of months, the spread started to march downwards again in November. Positive. 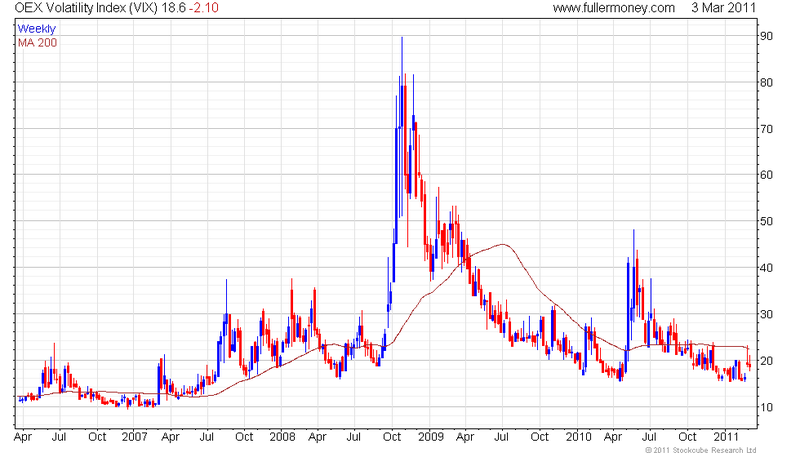 OEX volatility: OEX volatility continued to regress to break the 20% level, recently checked by events in North Africa and the Middle East. Neutral. S&P Case Shiller house price index: The latest data for US home values (December) published 22nd February have continued to go down for the 5th consecutive month, only two cities showing positive numbers. 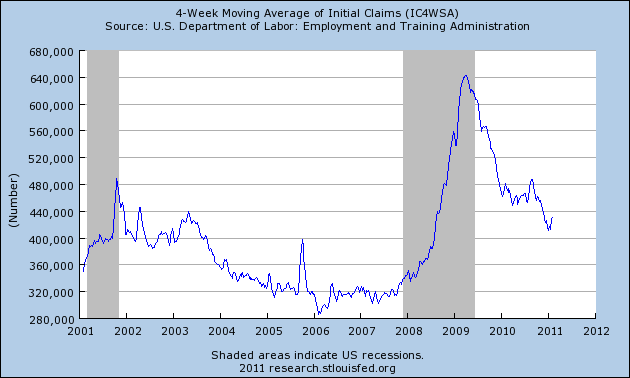 The slow recovery faltered. Negative. 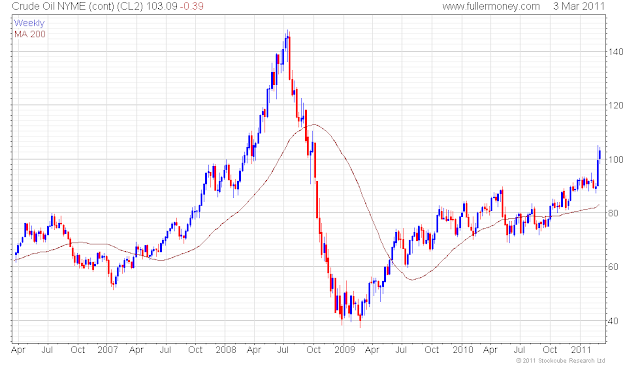 Oil price: The oil prices broke through $ 90/b to trade at $ 112 for the Brent and $98 WTI. The situation in the Arab world compounded already rising oil prices. Events in Libya (1.6 million b/day production, now shut down) escalated fears in the market even if there is no penury expectation due to spare capacity within OPEC that would come on-stream if needed (+/-3 million b/day). However, continued unrest in the region and a real possibility of this spreading to Gulf producing states, including Saudi Arabia, will continue to maintain high prices: this will act as a tax on growth; for the past 40 years, all recessions had oil prices spiking beforehand. In the US natural gas prices traded well below $4/btu until Friday when prices passed the $4 mark; still, they remain at depressed levels thanks to shale gas. 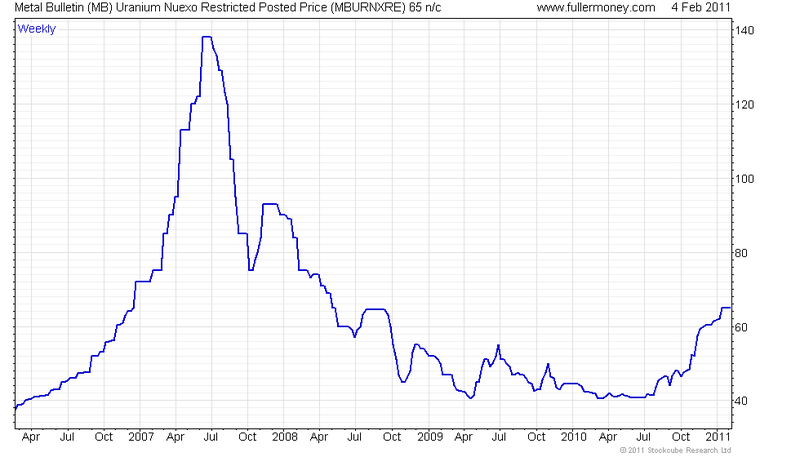 Uranium jumped 50% to $65 since our last review late September. Half-way has been walked to the June 2007 at $138: Negative. Conclusion: The indicators on the banking situation remain significantly positive, the rest definitely turned down. Equity markets are correcting (overdue since the divergence with the 200 days MA was getting overstretched); the risk is that this correction gathers pace due to higher oil prices and inflationary pressure already significant in fast growing economies (and starting to appear in the Western world) leading to monetary tightening. The magnificent 7 are telling us that it is time to reduce exposure to equity markets in fast growing economies and high beta stocks elsewhere. Continue investing in high yielding equities / net cash companies with a strong franchise. Opportunities will soon come up in emerging markets. 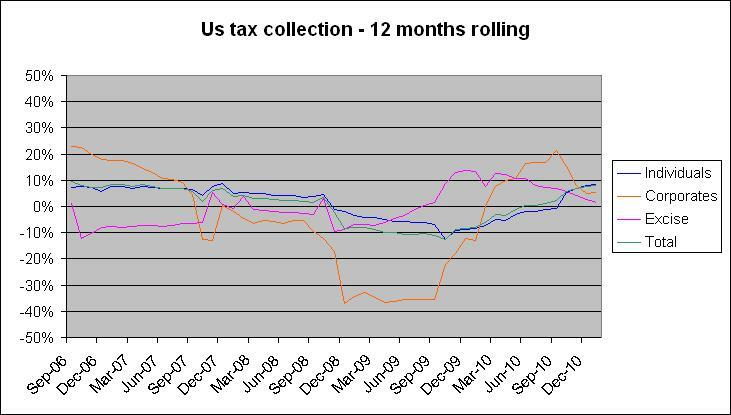 I follow US tax receipts which give a rather accurate picture of the state of the real economy. 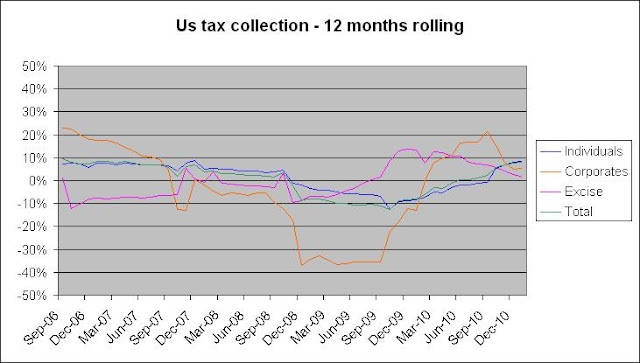 Whilst tax receipts from individuals have turned around in November 2009, they started to be positive in May 2010 and have substantially increased for the sixth month in a row to January 2011. 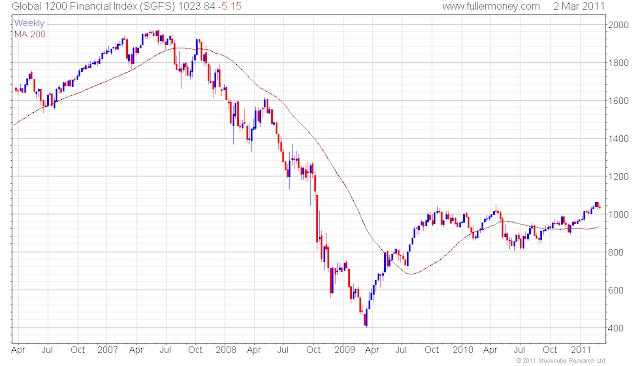 On the corporate front, the turnaround was in September 2009 and numbers became positive in February 2010. All-in-all, tax receipts increased USD 44 billion in FY 2010 (end September) compared to FY 2009, the latter collapsing USD 248 billion with respect to FY 2008. For the first four months of FY 2011, tax receipts are USD 50 billion higher than in 2010, over 90% of this improvement coming form individuals. These tax receipts are matching the (slow) improvement in the US unemployment situation: the US added 1 million jobs over 12 months and all indicators were better in January 2011 compared to January 2010 (duration of unemployment, part-time workers for economic reasons and no change for discouraged workers). The unemployment rate is down to 9%. 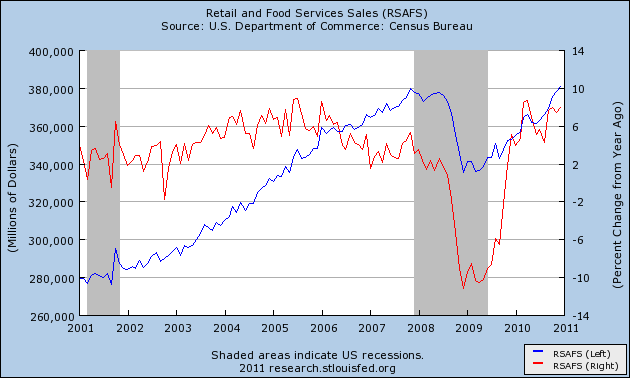 This tells me that consumers are better off and this is translating into other economic data like retails sales; the yoy rate of change is back to historic levels. 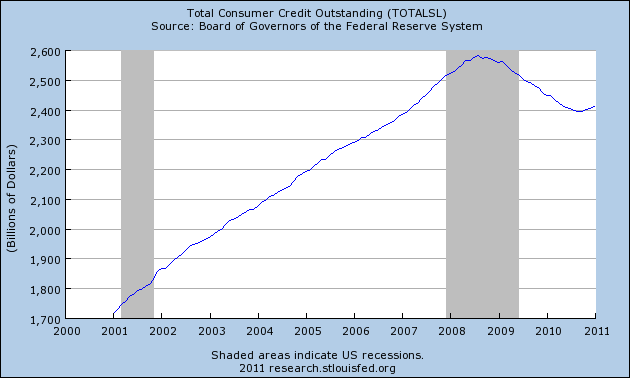 Total credit available to consumers has also turned around. We are not out-the-woods as yet, but trees’ density is reducing. Nuclear power generation is today the only viable and credible route to match growing electricity demand in fast expanding economies but also in the West to meet CO2 emission reduction targets. A large portion of uranium mines are located in deemed “safe zones”. 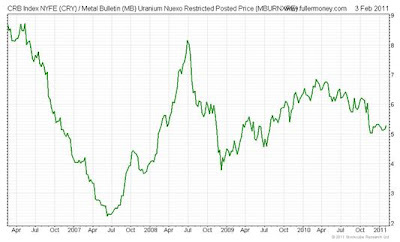 Uranium prices reached their top ahead of other commodities and lagged during the recovery phase: in 2010 and 2011, uranium prices substantially closed up the gap. I do not perceive a risk of shortage with expected increase in production from major providers and secondary source (new START agreement in particular) and therefore does not pose a constraint to an extension of nuclear energy; in case of major stress, stockpiles could be used (just below 3 years of mine production at 2010 rate of extraction). With incremental production required, prices will continue to move upwards for mines to be economically viable to match demand. 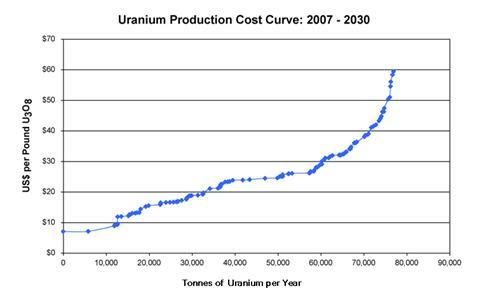 The price of mined uranium is not as fundamental as oil as a usable combustible. 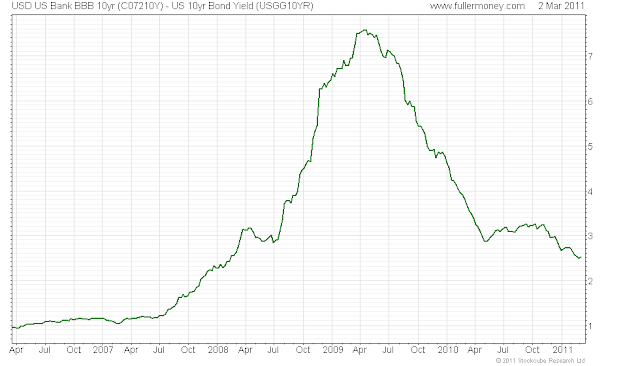 2007 peak was mostly speculative, nothing really happening on the field; actual move is based on fundamentals. Uranium shares recovery is spectacular and a correction is overdue. 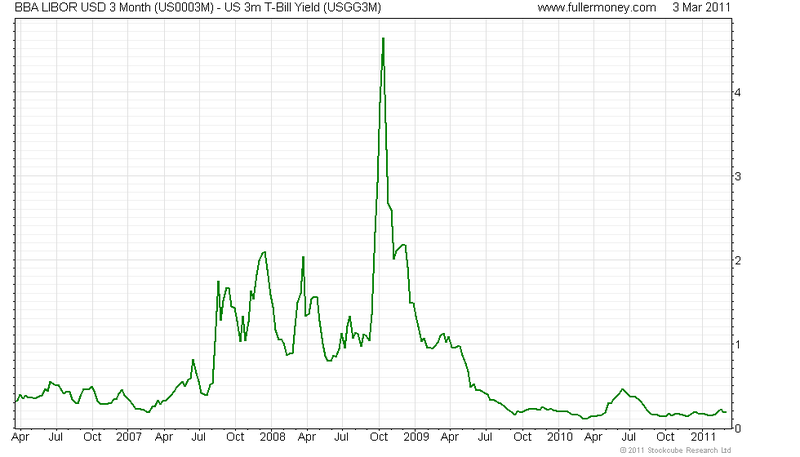 For the long term investor they represent an added leg to the energy/commodity secular theme. The world population without access to electricity amounted to 1.5 billion people in 2008 and will still represent 1.3 billion people in 2030. According to the International Energy Agency, Electricity is the world’s fastest-growing form of endues energy consumption as it as been for the past several decades. Net electricity generation worldwide will rise by 2.3 percent per year on average from 2007 to 2035, while total world energy demand grows by 1.4 percent per year. 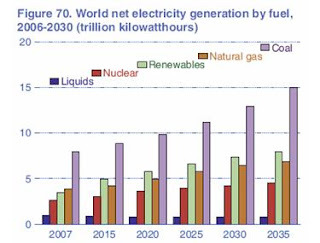 This would represent a World net electricity generation increase of 87% (reference case), from 18.8 trillion KWh in 2007 to 25.0 trillion KWh in 2020 and 35.2 trillion KWh in 2035. Non-OECD countries will account for 61 percent of world electricity use in 2035 (non-OECD increasing at 3 times the pace of OECD countries, at 3.3% / year). Nuclear power generation represents a small portion of the world total electricity production, whilst increasing from 2.6 trillion KWh in 2007 to 4.5 trillion KWh in 2035 as high fossil fuel prices (particularly from non-conventional sources or difficult to extract conventional ones) and concerns about security and greenhouse gas emissions support the development of new nuclear generating capacity. Currently, the share of nuclear electricity generation varies widely between regions and within OECD countries, from over 75% (France, Lithunia) to less than 5% (China, India, Brazil, The Netherlands, Pakistan, Mexico, South Africa). Nearly 72 percent of the world expansion in installed nuclear power capacity is expected to take place in non-OECD countries, particularly China where estimates range widely in both timeframe and capacity; the IEA forecasts China to add 66 GW by 2035 (China announced a total capacity of 40GW – some officials put the figure at 80 GW -in 2020 vs. 10.3 GW end 2010). 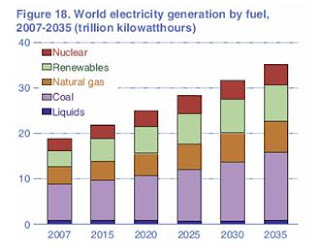 For reference, in 2006, the world had 435 reactors located in 30 countries producing 370 GW; by 2035, 350 reactors are planned worldwide representing an electricity generation of 330GW. According to the International Atomic Energy Agency, from 2012 ten or more new reactors will be connected to the grid every year, the first time since 1990. Furthermore, world average capacity utilization rates have continued to rise over time, from about 65 percent in 1990 to about 80 percent today, with some increases still anticipated in the future. In addition, most older plants now operating in OECD countries and in non-OECD Eurasia probably will be granted extensions to their operating licenses. Despite these developments, nuclear electricity will remain a small portion of the total production. Notwithstanding the difficulty to forecast nuclear plant construction over the long term, the IEA increased by 9 percent last year’s projection. In addition, new technologies are being developed in the field of micro-nuclear reactors that could match an untapped sector so far. The USA is developing an underground reactor technology of 140MW whilst France is well advanced with small offshore nuclear power plants of 50 to 250 MW. 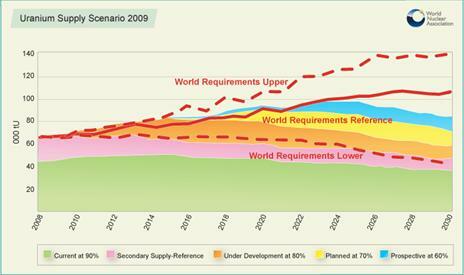 Still, there is considerable uncertainty associated with nuclear power projections. Issues that could slow the expansion of nuclear power in the future include plant safety, radioactive waste disposal, rising construction, maintenance, and decommissioning costs as well as investment risks, traditional fossil energy prices, and nuclear material proliferation concerns. About 63 percent of the world's production of uranium from mines is from Kazakhstan, Canada and Australia. An increasing proportion of uranium, now 36%, is produced by in situ leaching. After a decade of falling mine production to 1993, output of uranium has generally risen since then and now meets 76% of demand for power generation. Kazakhstan produces the largest share of uranium from mines (27% of world supply from mines), followed by Canada (20%) and Australia (16%). Namibia (+127%) is the fastest growing supplier after Kazakhstan (+352%). The world's known uranium resources went up 15% in two years to 2007 due to increased mineral exploration since uranium recovery prices in 2003; the known recoverable resources of uranium were 5.4 million tU in 2009 with Australia holding 31% of this total, Kazakhstan 12%, Canada and the US 9% each (based on a market price of USD 130 / kg). 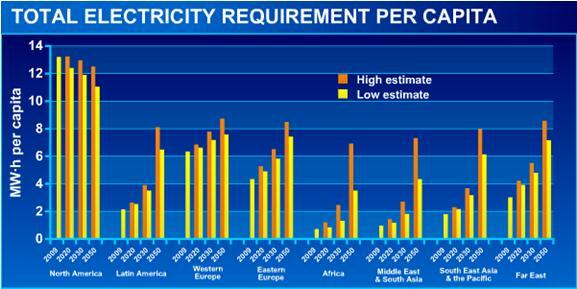 This represents 80 years of supply at the current projected new reactors. 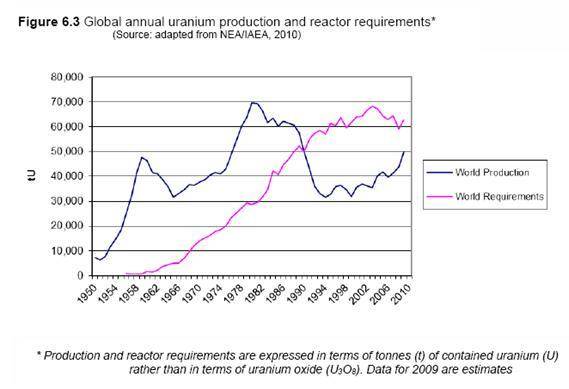 The World Nuclear Association (WNA) reference scenario projects world uranium demand as about 77,000 tU in 2015, and most of this will need to come directly from mines (in 2009, 24% came from secondary sources). China alone, would have consumed 15,000 tU in 2010, 27% of world mines’ production. The World Energy Council forecast demand to reach between 105,000 tU and 140,000 in 2030. Whilst demand has substantially increased over the past few years to reach an estimated 68,640 tU in 2010 (equivalent to 80,954 tU3O8), production has also significantly expanded and, in 2009, covered approximately 76% of utilities’ requirements. 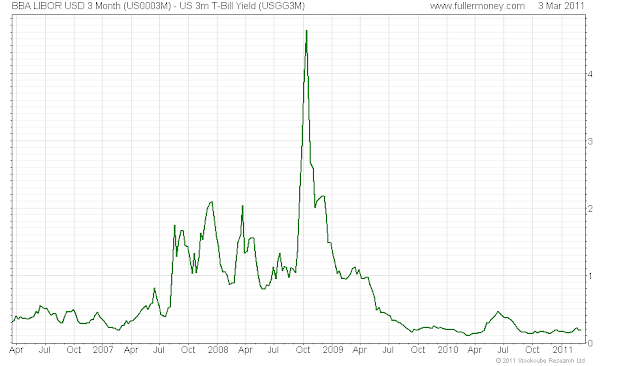 There is no sign of undersupply if the price, like all commodities, is high enough to be economically extracted. The graph below shows the elasticity of price to demand: we are nearing an inflexion point at around 65,000 tU3O8 which requires higher market prices to maintain margins. The new START accord signed Saturday February 5 between the USA and Russia aiming at further reducing the nuclear arsenal on both side (the previous one was expiring end of 2013) will also bring additional secondary supply. The perception of imminent scarcity drove the "spot price" for uncontracted sales to over US$ 100 per pound U3O8 in 2007 but it settled back to $40-45 over the twelve months to July 2010. 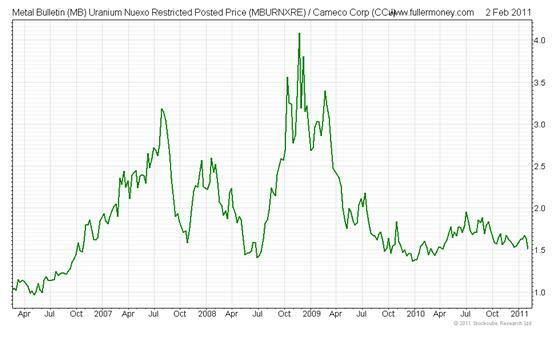 Most uranium however is supplied under long term contracts and the prices in new contracts have, in the past, reflected a premium above the spot market. The year-end price of $62.00 per pound U3O8 reported by uranium market information specialist TradeTech was the highest value reported since September 2008. At the beginning of 2010 the spot price stood at $44.50 per pound, and had been declining since 2008 in line with the global financial crisis. It reached an annual low of $40.50 in March, before prices began to strengthen and the decline was reversed. In November, prices accelerated and the spot price ended the year above $60 per pound for the first time since August 2008. From nadir to trough prices collapsed 71% to recover by 80% to Januray 31, still lagging the other commodities complex, albeit slightly. As well as an increasing spot price, 2010 also saw record activity on the uranium spot market with an annual sales volume of 42.8 million pounds. The spot market has not seen activity close to this level since 1990, when spot market sales reached 40.6 million pounds. Record sales volumes were reported in December, which TradeTech said was due to Chinese nuclear power expansion plans and the signing of two new contracts for long-term uranium supply exciting renewed interest from the financial and investment sectors. 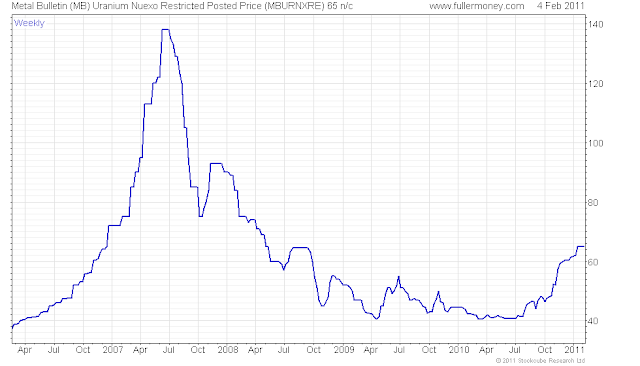 The spot price for uranium rose again in January for the eighth consecutive month. Thin spot supplies continue to exert upward pressure on the uranium spot price and TradeTech’s Exchange Value is $72.25 per pound U3O8, an increase of $10.25 from the December 31 Value, 70% higher than a year ago. 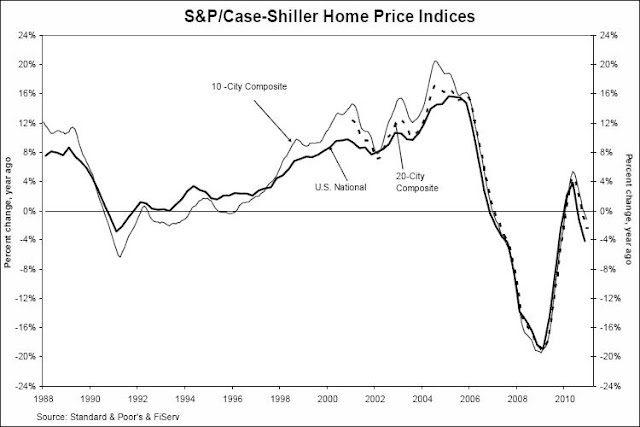 The shift from a buyers’ market to a sellers’ market that began last year gained new momentum in January. A driving force behind this increase is the ambitious nuclear program in China, along with reports in recent months from several producers that they will not meet production targets. Clearly, the base formation is completed and we have entered a momentum phase. Uranium tends to substantially outperform and underperform other metals as the graph below shows. Since April 2009, the ratio has moved in a narrow range between 5 and 7, uranium outperforming since April 2010. 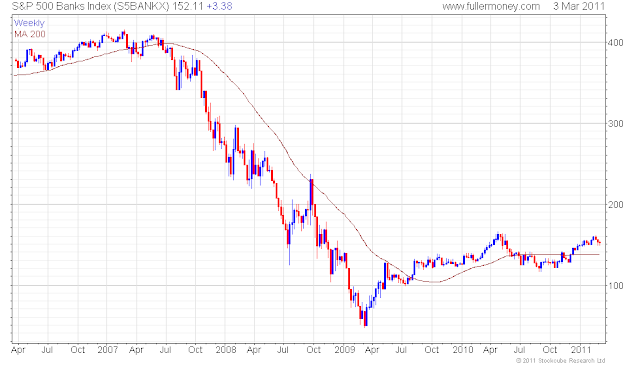 A very similar pattern applies between oil and uranium. 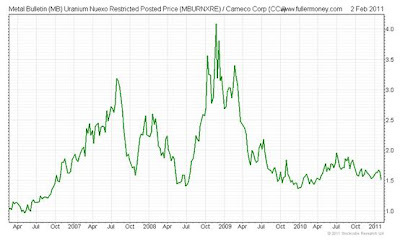 If we take Cameco as a proxy for uranium shares and compare it to uranium prices, uranium shares have substantially outperformed during the 2008 financial crisis, and from Q3 2009 both have been moving more or less in synchrony. Among these, besides Cameco, all large producers are either integrated mining companies or nuclear companies or are state-owned. In addition, approximately 400 junior mining/exploration companies exist. 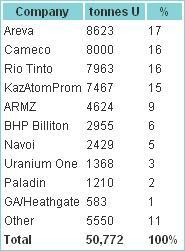 A few investment vehicles are available to play the uranium story, but all ETF are encompassing the nuclear industry as a whole and are therefore not limited to uranium mining companies. For Areva, investors can only buy non-voting shares, and the company is always subject to French political jittering, but remains the world largest integrated nuclear company. The fantastic performance displayed by uranium companies has mainly been realized over the past 6 months and a correction is overdue that will provide opportunities to buy. Less than 20% of the world's uranium supplies are traded on the spot market, rather than under long term contracts, but the price in long-term contracts is often related to the spot price at the time of delivery.